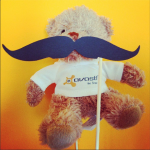 Avast Mo Bros have committed to grow a moustache for the 30 days of Movember* to make a difference and have fun. Why? Because we care! The moustache is our ribbon, the symbol by which we generate conversations, awareness and raise funds for men's health. Avast Mo Sistas support us. If you do as well, show us your support. Like or make a donation on our Movember page. You can encourage us and also show your support by submitting your picture with a moustache across social media channels. Use the hashtag, #AVASTmovember! We will collect them and display in our Facebook photo gallery!